Zoltán Hirsch was a Hungarian Jew and a person of short statue, who performed as clown and acrobat (stage-name Zoli Hirsch) in circus and vaudeville shows. In 1942, the world-renowned circus performer self-published an autobiography entitled “The great Life of a Little Man artist”. During 1943, the Hungarian authorities passed as series of anti-Semitic decrees, which, among others, strictly imitated the employment of Jews in artistic professions. Apparently as a consequence of this measure, Hirsch got dismissed from the Hungarian circus Fényes, where he was engaged back then. When in March 1944 the German Wehrmacht occupied Hungary, the situation for Jews worsened rapidly. They had to wear yellow stars, young Jewish men were used as forced labourers, ghettos were established. Hirsch tried to survive with book-peddling, but he was arrested for doing so and allegedly also for wearing a too small yellow star, although the emblem was actually proportional in his size. He got imprisoned and soon transported to the concentration camp Auschwitz-Birkenau. There Hirsch “had to suffer through daily humiliation as a doorman dressed in spectacular uniforms at the camp gates where he was ordered to salute the Nazis passing by”, wrote Yehuda Koren and Eliat Negev. However, Hirsch did not survive the camp. He died in the gas chamber in 1944. 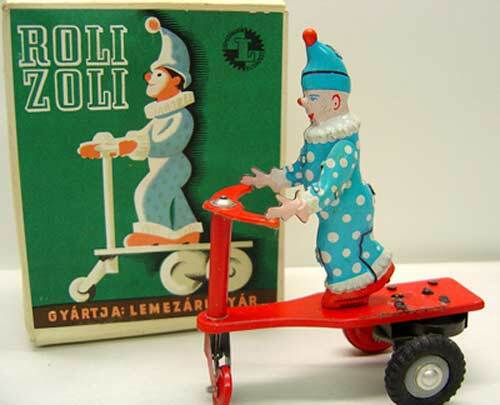 In the 1970ies Hirsch got immortalized in a toy, the Roli Zoli, a mechanical toy representing a tin clown on a red motorcycle. Hirsch, Zoltán: Kis ember nagy élete [The Great Life of Small Man], Budapest 1942; Kérchy, Anna: From Showbiz To The Concentration Camp: The Fabulous, Freakish Life Of Hungarian Jewish “Dwarf “Performers, Zoli Hirsch And The Ovitz Family, in Kérchy, Anna and Zittlau, Andrea: Exploring the cultural History of Continental European Freak Shows and Enfreakment, Cambridge 2012, p. 211-232.; Koren,Yehuda and Negev, Eliat; In Our Hearts We Were Giants. The remarkable Story of the Lilliput Troupe – A Dwarf Family’s Survival of the Holocaust, New York 2004.